Mariachi has always has been a part of la música de mi familia, la música de mi gente. When I was a little girl, my mom used to sing in the kitchen all the time. The window from the kitchen faced the front of the house, so I’d hear her as I was coming home from school. She would sing corridos and mariachi songs and all kinds of Mexican music. Sometimes she’d sing with the radio and sometimes she’d sing a cappella. I loved her songs; they always made me feel connected to my culture. We grew up listening to that music, and we have a heartfelt reaction whenever we hear it. So when I received Finding the Music / En pos de la música to review for De Colores, I was looking forward to reading a culturally rich bilingual story about mariachi—the music itself, the people who perform, and the Raza community in whose hearts the music lives. On the surface, the story is endearing: A pre-teen girl accidentally breaks a beloved family heirloom. She goes around town looking for some way to fix it before her mom finds out what she has done. When the girl figures out that fixing it will take a long time, she decides to fess up to her mom, who forgives her. But the problems are in the cultural details—or rather, lack of them. On the cover, we see young Reyna, wearing a sombrero de charro and holding a vihuela. One of her hands is on the struts and the other is on the base of the instrument. Although there are visual allusions to music emanating from her guitar, she is not playing the instrument. Reyna’s mamá runs a popular Mexican restaurant. It’s noisy. My experience with noise in a Mexican restaurant is usually because of very loud music, and people have to talk over the music in order to have a conversation and be heard. Here, there’s no music and everyone seems to be shouting and arguing, which is what bothers Reyna. I just don’t see that in a restaurant. Reyna sits in a booth reading, and, one day, frustrated by the noise, she throws her book in the air, knocking down her abuelito’s vihuela, which had been hanging on the wall. I can’t believe that, while everyone else sees and hears the vihuela crash to the floor “with a loud thud,” Reyna’s mother doesn’t come running out of the kitchen. Reyna had never heard Abuelito play the vihuela, but every night at bedtime Mamá described the Mexican folk songs he had performed. She said the music was like an old friend, taking your hand and pulling you onto the floor. Reyna desperately tries to find someone who will help her fix her abuelito’s broken vihuela before her mamá finds out what she’s done. This makes no cultural sense. Hiring a mariachi conjunto to play at a wedding would cost a lot of money. Reyna’s abuelito and his mariachi conjunto’s playing at their friend’s wedding was not instead of a gift, it was their gift. Reyna’s school’s music teacher can’t fix the vihuela either, but she gives her what Reyna calls “an old hat”—actually, a sombrero de charro—originally, a gift from Reyna’s abuelito. Señor Marcos, at his shop called Adelita Music Shop (named for La Adelita, the Mexican revolutionary? ), can fix the vihuela, but it will take some time, so he gives Reyna an old recording of her abuelito’s mariachi music. The recording is Cielito Lindo, which also happens to be the name of her mamá’s restaurant. So Reyna goes back to the restaurant, tells her mamá what happened, and shows her all the stuff she’s been given. At dinnertime, she puts on the record, and they dance, “laughing and spinning,” to Cielito Lindo, which is hardly a spinning song. The End. All of these superficial cultural icons—vihuela, photograph, sombrero de charro, and recording—appear to be an attempt to place a thin veneer of Raza culture where there actually is none reflected in the story. Alarcão’s acrylic illustrations are a shallow depiction of the culture as well. The restaurant is devoid of anything Mexican, except for a stereotypical collection of icons on a wall—there’s the vihuela, a Día de los Muertos skeleton mariachi, a papel picado of three skulls, a luchador near a Virgen de Guadalupe, a folklórico dancer, and two pictures of men in sombreros. While Alarcão draws some of the characters realistically, he caricatures others, such as two rough looking guys loudly arguing, and a young Black woman with hair that looks like strips of brown construction paper have been pasted onto her head. In addition, the art appears to be at odds with the story. 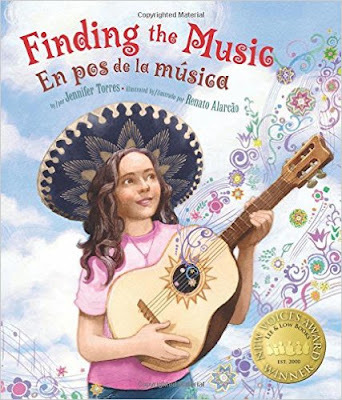 For instance, while the cover shows Reyna holding her abuelito’s vihuela, the story doesn’t even have her expressing that she’d like to learn how to play it. Also, while the story refers to the music teacher’s pulling weeds in her garden, in the illustration she’s not pulling weeds. She’s not even wearing gloves or holding a weeding tool—and her garden is postcard-perfect, with not a weed in sight. From the inside cover: “Finding the Music / En pos de la música is a heartwarming bilingual tale of family, community, and the music that brings them together.” But it’s not. It’s a contrived story that purports to show how the people in the community are related to the protagonist’s grandfather. But the community does not come together to solve a community problem; rather, they’re all individuals, the problem is that of an individual, and the child has to figure out the solution by herself. “Little does Reyna know along the way she will find herself growing closer to Abuelito and to the power of his music,” the copy also reads. This, too, does not happen. Although she comes from a mariachi family, Reyna may have never heard mariachi music, but she’s heard many descriptions of mariachi music from her mamá. And like Reyna, young readers will not learn anything about mariachi either. The story is just cultural tourism—a superficial tale that appropriates Mexican American lives without providing any depth of cultural learning. Finding the Music had potential. It could have explored a young Latina’s discovery of the music, embracing the music and wanting to learn to play the music. It could have explored what it is about mariachi that’s so soulful to Raza children. But Finding the Music / En pos de la música doesn’t do any of this and, as it stands, I can’t recommend it. 2. A non-Latino family moves into the neighborhood. They visit Mamá’s restaurant and fall in love with the mariachi music playing on the radio. Reyna, who comes from a mariachi family, introduces the new neighbors to her barrio, and offers to teach their daughter about mariachi music and culture. 3. Mamá and her family have had to sell their restaurant and move out of their barrio. In this neighborhood where Spanish is not typically spoken, there are no close neighbors and no corner bodegas, and mariachi music is rarely heard. Mamá and Reyna voice their loneliness for their friends, culture and language. They have a difficult decision to make. 4. Mamá and her family move to a new barrio, where Spanish is spoken and the local radio station plays mariachi music, but there are no mariachi conjuntos as there were in their old neighborhood. Lonely for the music of their gente, the family organizes to form a fledgling mariachi student group, who, with discipline, hard work and passion, will eventually bring mariachi music back to their barrio. I'm wondering what to make of the fact that this author won the Lee and Low New Voices award for the manuscript that eventually became this book. Lee and Low has been a champion for diverse voices in children's books. How did they get this so wrong? There's a requirement for picture books published in the United States to have the child solve the problem. This creates distortions and contrived situations, especially when solving problems is a family or community enterprise. We need to get away from that formula to achieve true diversity in children's books. A "requirement" or "tradition," Lyn? I did not know that. Could you say more about this? Thanks for bringing this up.